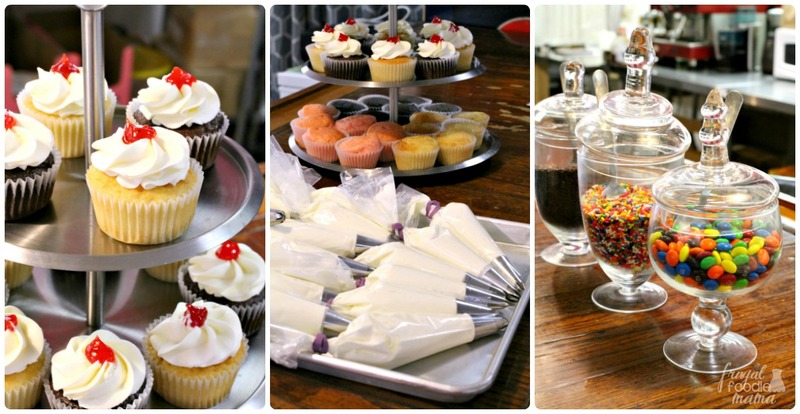 Can we have a quick chat about kids' birthday parties for a moment? Up until my daughter's most recent birthday, we had always had a themed family party at our house & allowed her to invite three of her friends from school. For her sixth birthday just last month, we finally caved & decided to let her have a separate party for her friends from school. Having limited parking at our house, I knew we would have to rent a space somewhere local to host her party for her friends. After a little crowd sourcing on Facebook, we found a cute little cupcake shop in the next town over that rented out their bakery for parties on the weekends. I put down the deposit and then started brainstorming party game ideas & searching Amazon for cute cupcake themed party favors. Everything was coming together. The invitations had been handed out to her classroom a couple of weeks before the party date. My mom (who happens to be much craftier than I) created an amazing pin the candle on the cupcake game. I bought a cupcake bingo game from etsy & found free printable cupcake coloring pages online. But a week out from her party I started to get this sinking feeling. Only 2 of the 14 kids she had invited had RSVP'ed that they were coming. Panic started to set in. What if it was only my daughter & these two friends at her party? Did I really just spend *that much* money to rent a cupcake shop only for there to be just 3 kids at the party? Then I get a text a few days before the party from a parent saying that her daughter would be there, but could her other 3 kids also come? Then a new wave of panic set in. What if every kid my daughter had invited to her party showed up with 1-2 siblings in tow?? I started freaking out that I wouldn't have enough cupcakes for them to decorate or snacks for them all to eat. 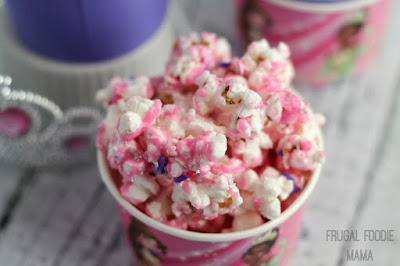 In fact, I made a double batch of this Funfetti Cupcake Popcorn recipe that I sharing with you all today for the party just to be on the safe side. Who knew that a six year old's birthday party could be so anxiety inducing? And what has happened to party etiquette these days where parents don't feel the need to RSVP one way or the other for kids' parties? Granted, I have been guilty of forgetting or waiting until the last minute myself to RSVP (or just showing up with my daughter). But man, you don't realize how aggravating it is for people not to RSVP until you are hosting your daughter's first kids only birthday party! They all got to frost & decorate their own cupcakes. They played cupcake BINGO, and pinned candles on a giant paper cupcake, and colored countless cupcake coloring pages. We served chips, and pretzels, and the tasty Funfetti Cupcake Popcorn I created just for this party. 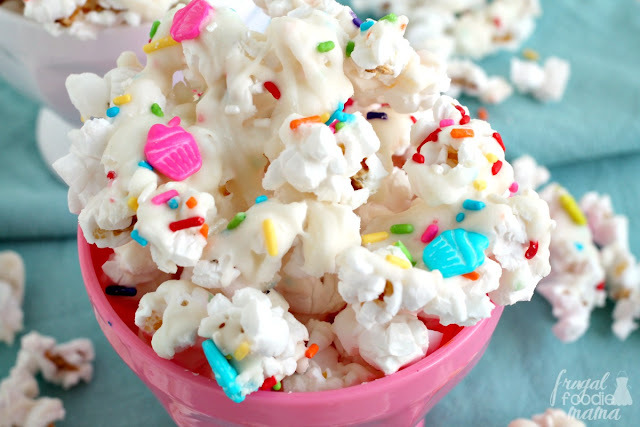 I really wanted to use cupcake shaped sprinkles in this popcorn recipe, but couldn't find any at my local grocery stores or craft stores. Thank goodness for Amazon because (as always) they came through for me! 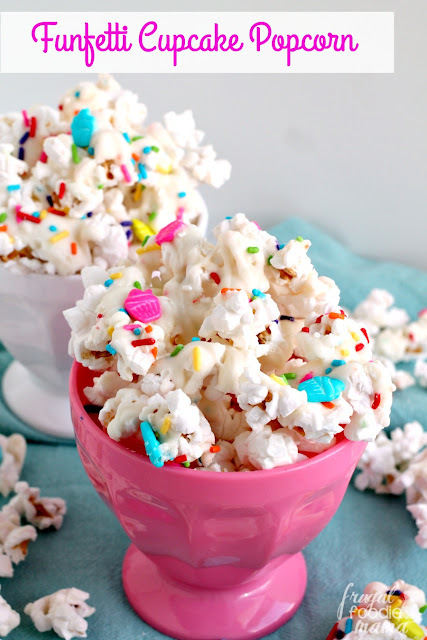 :) I snagged a jar of this Festival Cupcake Party Sprinkle Blendz for under $6. 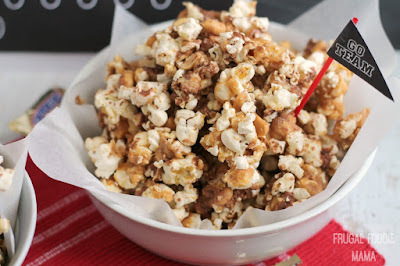 Spread the popped popcorn onto a large sheet of parchment paper. Place the white chocolate/bark & the oil into a microwave safe bowl. Microwave on high for 30 seconds. Stir. Continue microwaving in 20 second intervals, stirring in between until completely melted & smooth. Once melted, stir in the cake mix. 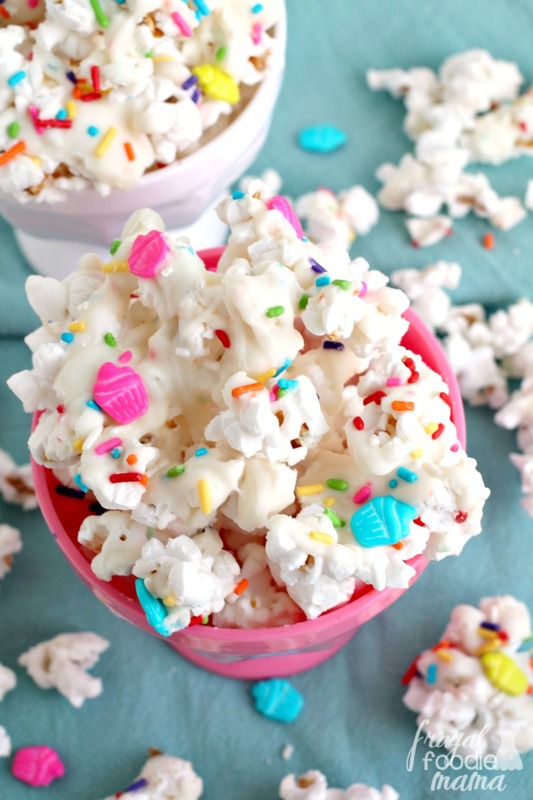 Immediately drizzle the popcorn with the melted white chocolate mixture. Using a rubber spatula, gently turn the popcorn to cover evenly. Immediately sprinkle the popcorn with the rainbow sprinkles and the cupcake shaped sprinkles. 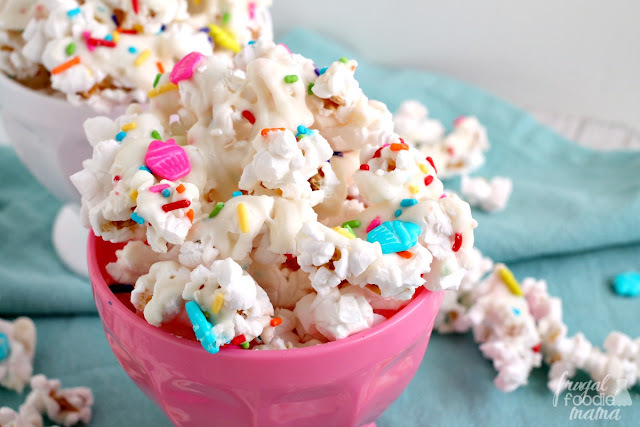 Turn again with the rubber spatula to evenly coat the popcorn with the sprinkles. 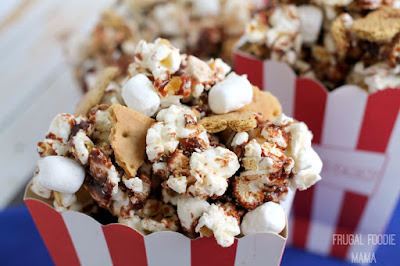 Allow the popcorn to sit out until the melted chocolate has set completely- about 20-30 minutes. 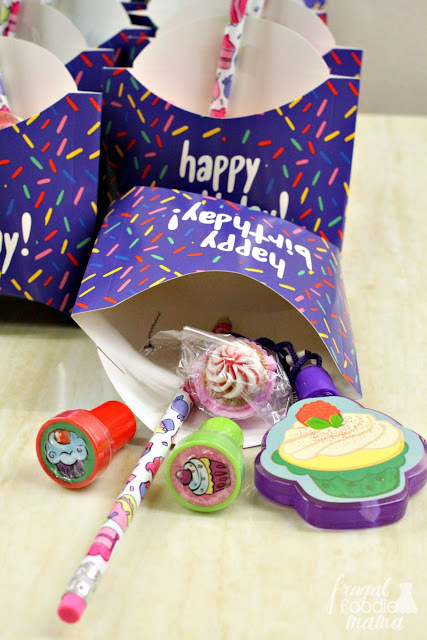 Have you hosted a kids only birthday party recently?